I have become fixated on this yarn. I have never before had a yarn so beautiful that I didn't even want to knit it. I have several similar photos of it that I keep looking at over and over, although the photos naturally do not show true. The colors are a little lighter and less reddish than they appear below. I can't explain it. I never thought of myself as an autumn person. The colors remind me of a stash afghan I made, Dr. Who, which I also love somewhat obsessively. 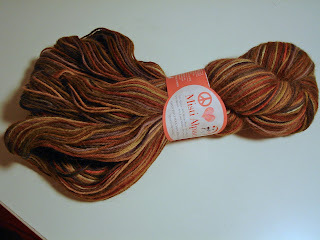 The yarn is Misti Alpaca Hand Paint Sock Yarn made of alpaca, merino, silk, and nylon, so it's not just the color. I think the combination of alpaca and silk is the best- feeling yarn made. I came across this yarn at a little local yarn shop in Evanston called Montoya Fiber Studio. The name makes it sound like all the yarns come from Spain or Latin American. Cathy Montoya indeed carries Manos and Malabrigo, but she has a wonderful selection of all kinds of yarn from all over. This is my new favorite shop. Even though there are great stores in Chicago, my current favorites are suburban, Montoya and Mosaic in DesPlaines. These stores are older than the city ones and have a more distinctive character. Montoya has a particularly warm and welcoming feeling. Cathy showed off this yarn, in this colorway, by knitting it up into a lace scarf. It was stunning. I bought the pattern, which is by Ann Nordling, and will probably make it if I can ever bring myself to take needle to this exquisite yarn. Cathy chose to make a scarf because she says the yarn is too good for socks. I can see her point, but I don't know. They would be socks to go down in history. But the scarf makes the yarn more visible. Luscious yarn. I vote for the history-making socks; you would feel sooooo pampered every time you wore them. Mmmmm (not meh). On my one visit to Evanston a few years ago I found a nice, small yarn shop -- perhaps it was the same one? I don't remember its name. It was a sweltering day in August but I just had to buy some souvenir yarn.